Macbeth’s Head, produced by Malfi Productions and playing at the Toronto Fringe Festival, embraces its own wild silliness. Though it had solid acting and very funny moments, particularly near the beginning, this Shakespeare-inspired comedy sometimes seemed like it had too many ideas. I ultimately felt as though this play — rather like Macbeth himself — became so ambitious that it forgot to keep having fun. The story revolves around two actors, Tim (Roberto Esteves) and Rupert (Julian Nicholson), who accidentally awaken Macbeth’s severed head (Kyle McDonald). 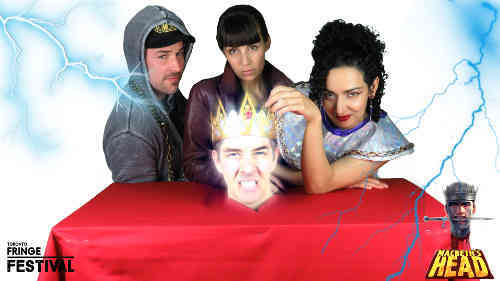 The Head enlists Hamlet (Gabriel DiFabio), Cleopatra (Roselyn Kaleda-Sedra), and a gender-bent Richard III (Adrienne Kress) to help him take revenge on Shakespeare himself (Scott McCulloch). Hijinks ensue. Macbeth’s Head opened strong — Tim and Rupert milked their chemistry, and the audience couldn’t stop laughing at the Head’s antics. The “frenemy” conversation was lots of fun, and I found it especially hilarious to watch the Head turn the pages of a book with his tongue! As the play progressed, however, it began to focus more on advancing the plot — which, to be fair, was clearly taking care to tie up its loose ends — and didn’t take time for as many of the small exploratory moments that had me laughing at the beginning. I feel as though Macbeth’s Head would benefit from a longer run time, if only to give it space to explore both its plot and its characters. The cast was uniformly strong; McDonald was particularly fun to watch. However, I wish that Cleopatra and gender-bent Richard had been able to contribute to the play in a more meaningful way. I couldn’t help but notice that, while Hamlet took on some complexity, the same wasn’t true for either of the play’s female characters. Through no fault of performer Kaleda-Sedra, I found Cleopatra’s fawning portrayal particularly not to my taste; I would have loved to see her progress beyond a one-dimensionally sexual, lovesick woman. All in all, Macbeth’s Head is worth seeing for its funny moments and well-written faux-Shakespeare. There are promising ideas here that I think will shine even more brightly with a little more time and a little more focus.